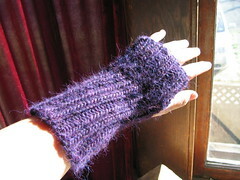 Here’s another wristwarmers pattern. Why more wristwarmers, you ask? Well, actually, this is the first pair I wrote my own pattern for, but I couldn’t post the pattern because the wristwarmers were supposed to be a gift for someone, so I had to wait until I gave her the gift. In the meantime, I made the cable wristwarmers I posted a few weeks ago. So here is the original pattern. It’s easier, so if the cabled version scared you, try these instead. I can make these in one (8 hour) day of knitting, and if you are not a slow knitter like me, you can probably make them faster. They are great for quick Christmas presents! 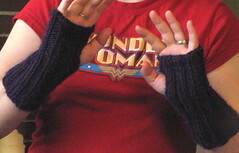 The wristwarmers are ribbed, with a vertical thumbhole. They are made of Cascade Pastaza, bulky yarn that is 50% Peruvian Highland Wool/50% Llama wool. (I really like this yarn!) They require US9 double-pointed needles. You can download the pattern right here. If you like it, please let me know. I am a new knitter and have only knitted with circular needles (handbags) I LOVE this pattern but the thought of trying to work with those 3 needles terrifies me! Do you think these can be made with circular needles? If so would you be able (and willing!) to list that? Thanks a million! Well, technically it is possible to use circulars IF they are small enough. But it is very difficult to find circs that small. I have a pair that I think are 7″, and the needle part is really really short — I got them at a thrift store. They might work for these. But yes, double-points are a much easier solution. Also, I don’t like to use sets of 5 needles in my knitting, so I write my patterns for sets of 4, so that’s a little easier to adjust to. this look very easy and i appreciate the work you have done to put them on the website. thanks hc. I use 2 circular needled when I make my hands (as I call them). You just have to figure out how to have them. I can do basic knitting,but I’ve also been trying to learn the kk also…is it possible to make these on a kk??? by kk I mean a knifty knitter…or knitting loom….for those who haven’t heard of one. They have round,long and other styles.Thanks. I guess you could make them on a loom, but as I don’t use a loom I can’t be absolutely sure. You can rib on a loom, right? And these are just ribbed tubes. But wouldn’t you need a really tiny loom? You can find short circulars online, just google them. I can’t remember the website I got mine from but I ordered 12″ & 7″ ones in the sizes I use the most often. Yes, I saw a bunch of short circs at the yarn shop just last week. Another option is to use the Magic Loop method, with a circ that has a really long cable. I’m currently knitting a hat that way. I definitely made these and loved them, but gave the first pair to my mom as they were intended. It’s my new go-to pattern for armwarmers. Some people are addicted to socks, I’m addicted to armwarmers. Thanks for the pattern, I don’t remember where I saw it, but since I am a first time knitter, I am a little hesitant…. Do I slip the first stitch on everyone of the ten rows? thanks so much for that pattern. I have a couple of questions. I do not knit on circular needles, only straight. 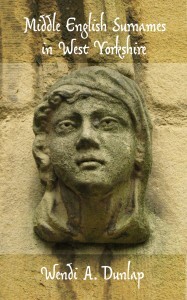 I will be knitting this on straight needles then sewing 2 sides, then felting. i will be adding a flap before i felt, then sew that on as well. I will be finishing with a cool button and braided yarn to wrap around the button for closure. I am going to be knitting in only one color. Why do you switch needle sizes between the main color section and the charted pattern section, then switch back? since i am doing this in only one color, what size needles do you recommend? it seems as thought the 15’s are used for the majority of the sleeve…should i go with those? thanks for any advice…as i am a rogue knitter and like to see what i can come up by taking already existing patterns and making them my own…i just started knitting last year…i have sewn almost all of my life…so i like to combine sewing with the knitting when i design things. it seems to work better for me right now, and i enjoy it.